Today’s banks are facing enormous pressures that include regulatory requirements, hefty penalties, increasing customer service demands, and ferocious competition from other financial institutions rapidly embracing customer-centric technology. Despite these challenges, banks can’t afford to scale down any efforts to ensure the highest standards of customer service. In fact, a recent survey by Pega and Finextra found that 90% of big corporations would consider switching to a different financial institution for better client service around onboarding, account maintenance, service requests, and inquiry handling. 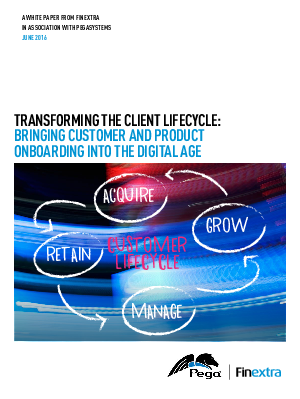 Download Transforming The Client Lifecycle: Bringing Customer And Product Onboarding Into The Digital Age, to discover other how banks are improving the customer experience to protect and grow their businesses.